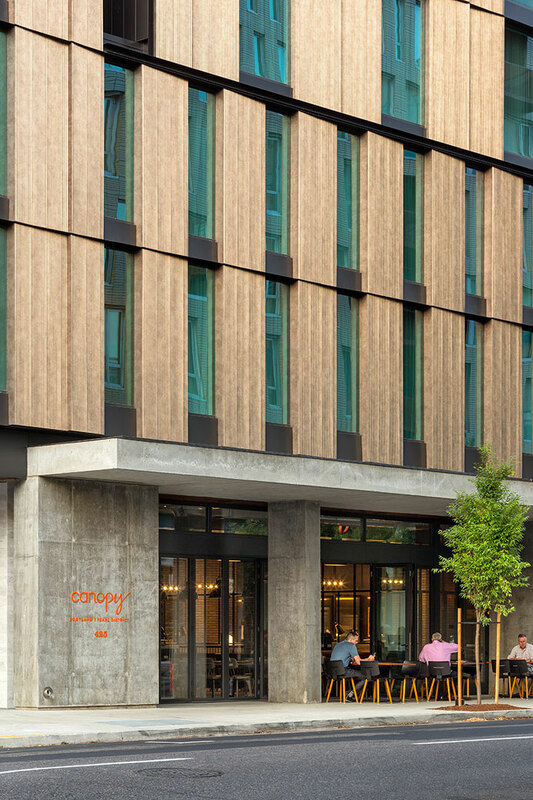 The architects at ZGF designed the property in the area’s revitalized industrial zone, providing both the exterior and interior planning for the 10-story hotel. 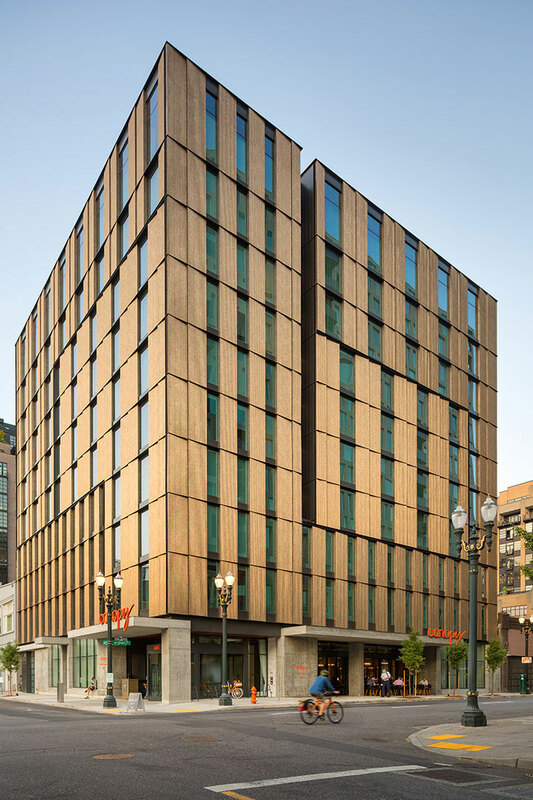 The hotel features 153 rooms and showcases all the Portland area has to offer. The constantly changing area is continuously expanding with new art galleries, microbreweries, green spaces and boutiques. The building features both folded concrete and bronzed-finished panels to blend classical and contemporary styles. 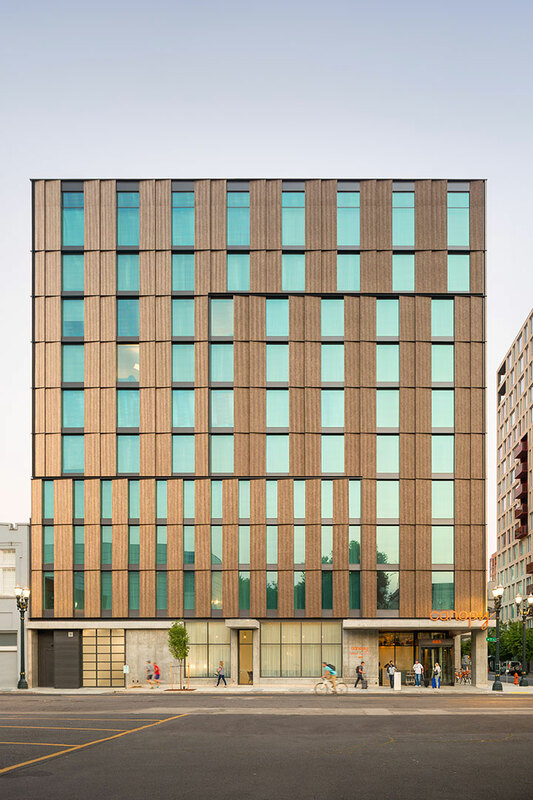 The architects further explain, “Custom print aged-bronze finish aluminum panels on the façade alternate with floor-to-ceiling glass windows to create dynamism and reflection; and panels themselves serve as a piece of art, appearing to change their golden hue in daylight. The custom panels were provided by Pure + Freeform in a Deco Bronze finish. The .8mm aluminum panels are coated with Lumiflon FEVE resin. Architectural coatings that utilize Lumiflon FEVE resin benefit from the advanced coatings formulation which provides durability and longevity. Surfaces enhanced with FEVE-based fluoropolymers showcase superior color and gloss retention and weatherability, preventing chalking, fading and other signs of coating degradation at the hands of UV radiation, salt, and moisture. 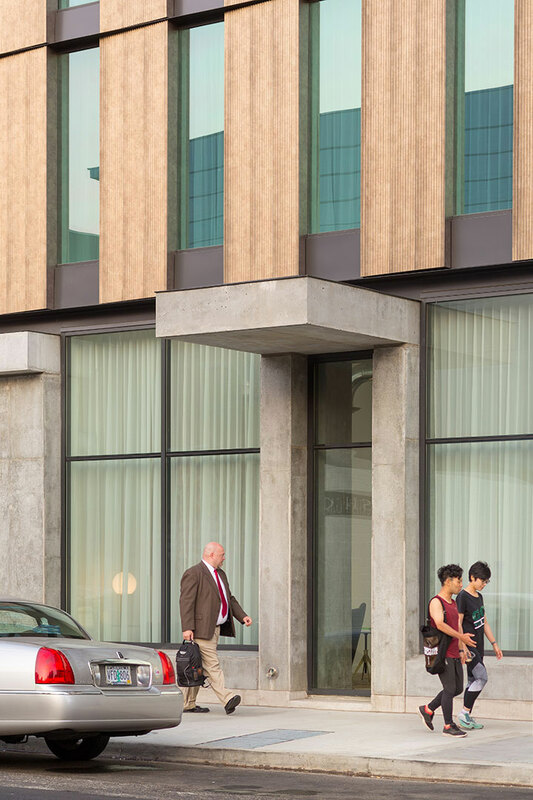 These advanced coatings are also corrosion-resistant, which will not just keep the coatings intact for extended periods of time but will also keep the appearance of the hotel in excellent condition for decades.